The Wilson 1000 roof mount CB antenna is a high quality semi-permanent two-way radio antenna. 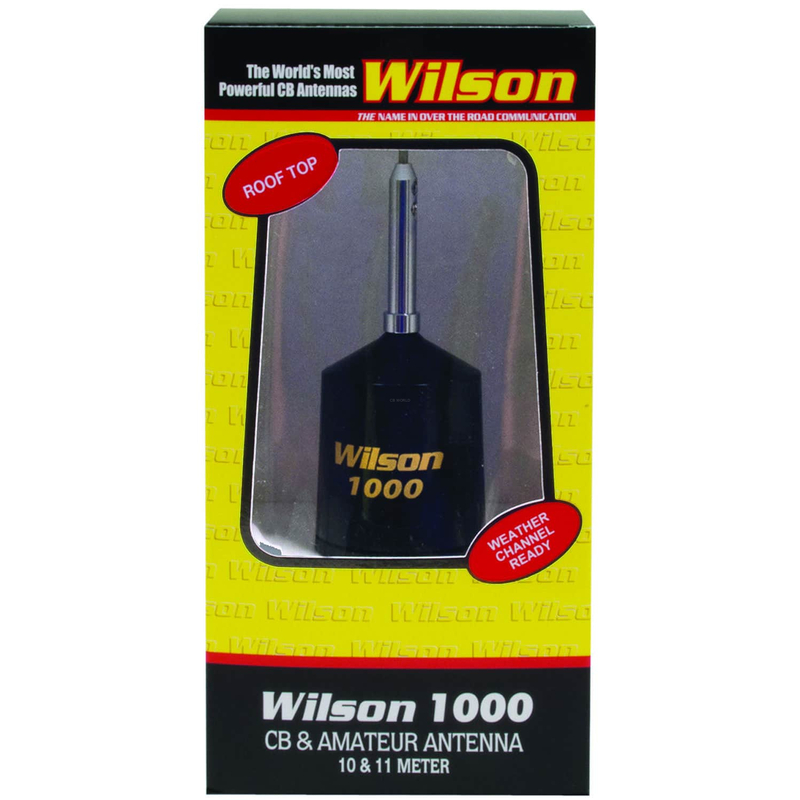 The Wilson 1000 has a reputation for being highly durable and one of the longest lasting CB or 10 meter antennas available on today's market! The Wilson 1000 roof mount antenna Installs through a ¾ inch hole drilled through the vehicle body. The Wilson 1000 is a seriously powerful antenna rated to a full 3000 peak watts, and can easily handle today's high powered CB and 10 meter radios! The Wilson exclusive floating coil is constructed from 10 gauge silver winding, yes its more expansive than other manufacturers antennas but it is the best performing coil currently available. The space age Mobay Thermoplastic base is virtually indestructible and provides armor like protection for the all import base loaded coil. The Wilson 1000 beat its closest competitor the K40 in independent laboratory testing conducted at Lockheed Martin, by a full 58% in performance gain! Wilson antennas are the most powerful mobile antennas for mobile two-way communication. 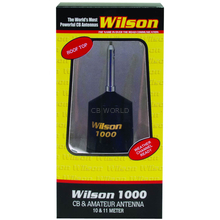 The Wilson 1000 is engineered for the highest quality, best durability, and longest life in the world of CB antennas. The Wilson 1000 is in a class all its own! The Wilson 1000 antenna is compatible with CB and 10 meter radios, and is ready to receive N.O.A.A. weather channels, if your mobile radio is capable of tuning them in. The Wilson 1000 Roof Mount CB antenna includes 17 feet of RG8X coax with a soldered PL259 connector. An additional PL259 is included should cutting the cable be required to allow easiest cable routing and antenna installation. 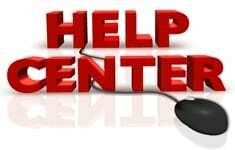 Tuning your Wilson 1000 for lowest Standing wave ratio is extremely easy thanks CB World's complete guide to antenna tuning available from the online Help Center. This is NOT a magnetic mount- see the W1000MAG-B if you are looking for the Wilson 1000 Magnetic Roof Mount.